Immunodeficiency occurs when the immune system cannot appropriately respond to infections. If a pathogen is allowed to proliferate to certain levels, the immune system can become overwhelmed; immunodeficiency occurs when the immune system fails to respond sufficiently to a pathogen. Immunodeficiency can be caused by many factors, including certain pathogens, malnutrition, chemical exposure, radiation exposure, or even extreme stress. HIV is a virus that causes immunodeficiency by infecting helper T cells, causing cytotoxic T cells to destroy them. Failures, insufficiencies, or delays at any level of the immune response can allow pathogens or tumor cells to gain a foothold to replicate or proliferate to high enough levels that the immune system becomes overwhelmed, leading to immunodeficiency; it may be acquired or inherited. Immunodeficiency can be acquired as a result of infection with certain pathogens (such as HIV), chemical exposure (including certain medical treatments), malnutrition, or, possibly, by extreme stress. For instance, radiation exposure can destroy populations of lymphocytes, elevating an individual’s susceptibility to infections and cancer. Dozens of genetic disorders result in immunodeficiencies, including Severe Combined Immunodeficiency (SCID), bare lymphocyte syndrome, and MHC II deficiencies. Rarely, primary immunodeficiencies that are present from birth may occur. Neutropenia is one form in which the immune system produces a below-average number of neutrophils, the body’s most abundant phagocytes. As a result, bacterial infections may go unrestricted in the blood, causing serious complications. Human immunodeficiency virus infection / acquired immunodeficiency syndrome (HIV/AIDS), is a disease of the human immune system caused by infection with human immunodeficiency virus (HIV). During the initial infection, a person may experience a brief period of influenza-like illness. This is typically followed by a prolonged period without symptoms. As the illness progresses, it interferes more and more with the immune system. The person has a high probability of becoming infected, including from opportunistic infections and tumors that do not usually affect people who have working immune systems. Image of HIV: scanning electron micrograph of HIV-1 budding (in green, color added) from cultured lymphocyte: Multiple round bumps on cell surface represent sites of assembly and budding of HIV. During primary infection, the level of HIV may reach several million virus particles per milliliter of blood. After the virus enters the body, there is a period of rapid viral replication, leading to an abundance of virus in the peripheral blood. During primary infection, the level of HIV may reach several million virus particles per milliliter of blood. This response is accompanied by a marked drop in the number of circulating CD4+ T cells, cells that are or will become helper T cells. The acute viremia, or spreading of the virus, is almost invariably associated with activation of CD8+ T cells (which kill HIV-infected cells) and, subsequently, with antibody production. The CD8+ T cell response is thought to be important in controlling virus levels, which peak and then decline, as the CD4+ T cell counts recover. Ultimately, HIV causes AIDS by depleting CD4+ T cells (helper T cells). This weakens the immune system, allowing opportunistic infections. T cells are essential to the immune response; without them, the body cannot fight infections or kill cancerous cells. The mechanism of CD4+ T cell depletion differs in the acute and chronic phases. During the acute phase, HIV-induced cell lysis and killing of infected cells by cytotoxic T cells accounts for CD4+ T cell depletion, although apoptosis (programmed cell death) may also be a factor. During the chronic phase, the consequences of generalized immune activation coupled with the gradual loss of the ability of the immune system to generate new T cells appear to account for the slow decline in CD4+ T cell numbers. Hypersensitivities are maladaptive immune reactions against harmless antigens (allergies) or against self antigens (autoimmunity). While the immune system is normally very tightly controlled to disregard “self” and harmless antigens, a condition known as hypersensitivity can override this control, causing illness and injury to an individual. Allergies result when the immune system recognizes harmless antigens, such as pollen or dust; they are characterized by red, swollen eyes, sneezing and itching, and can also encompass more serious symptoms such as anaphylactic shock. Autoimmunity occurs when the immune system recognizes “self” antigens and begins attacking them; antibodies that recognize self are termed autoantibodies. Maladaptive immune responses toward harmless foreign substances or self antigens that occur after tissue sensitization are termed hypersensitivities. This can potentially be very dangerous for an individual, as the immune response can be very powerful; it can destroy host tissue if not kept in check. The types of hypersensitivities include immediate, delayed, and autoimmunity hypersensitivities. A large proportion of the population is affected by one or more types of hypersensitivity. The immune reaction that results from immediate hypersensitivities, in which an antibody-mediated immune response occurs within minutes of exposure to a harmless antigen, is called an allergy. In the United States, 20 percent of the population exhibits symptoms of allergy or asthma, whereas 55 percent test positive against one or more allergens. Upon initial exposure to a potential allergen, an allergic individual synthesizes antibodies of the IgE class; this class of antibodies also mediates the immune response to parasitic worms. The constant domain of the IgE molecules interacts with mast cells embedded in connective tissues. This process primes, or sensitizes, the tissue. 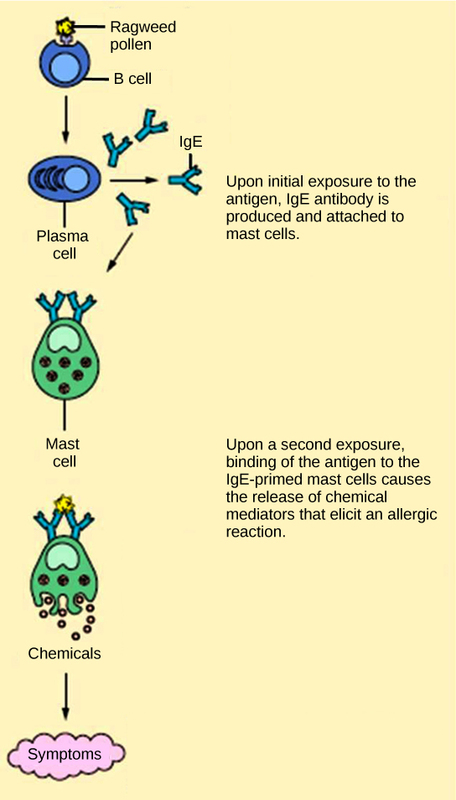 Upon subsequent exposure to the same allergen, IgE molecules on mast cells bind the antigen via their variable domains, stimulating the mast cell to release the modified amino acids histamine and serotonin. These chemical mediators then recruit eosinophils which mediate allergic responses. The effects of an allergic reaction range from mild symptoms such as sneezing and itchy, watery eyes, to more severe or even life-threatening reactions involving intensely-itchy welts known as hives, airway contraction with severe respiratory distress, and plummeting blood pressure. This extreme reaction is known as anaphylactic shock. If not treated with epinephrine to counter the blood pressure and breathing effects, this condition can be fatal. Allergens: This image shows an example of an allergic response to ragweed pollen. On first exposure to an allergen, an IgE antibody is synthesized by plasma cells in response to a harmless antigen. The IgE molecules bind to mast cells. On secondary exposure, the mast cells release histamines and other modulators that affect the symptoms of allergy. Delayed hypersensitivity is a cell-mediated immune response that takes approximately one to two days after secondary exposure for a maximal reaction to be observed. This type of hypersensitivity involves the TH1 cytokine -mediated inflammatory response. It may manifest as local tissue lesions or contact dermatitis (rash or skin irritation). Delayed hypersensitivity occurs in some individuals in response to contact with certain types of jewelry or cosmetics. It also facilitates the immune response to poison ivy and is the reason why the skin test for tuberculosis results in a small region of inflammation on individuals who were previously exposed to Mycobacterium tuberculosis. Cortisone is typically used to treat such responses as it inhibits cytokine production. Autoimmunity is a type of hypersensitivity to self antigens that affects approximately five percent of the population. Most types of autoimmunity involve the humoral immune response. Antibodies that inappropriately mark self components as foreign are termed autoantibodies. In patients with the autoimmune disease myasthenia gravis, muscle cell receptors that induce contraction in response to acetylcholine are targeted by antibodies. The result is muscle weakness that may include marked difficultly with fine and/or gross motor functions. In systemic lupus erythematosus, a diffuse autoantibody response to the individual’s own DNA and proteins results in various systemic diseases. 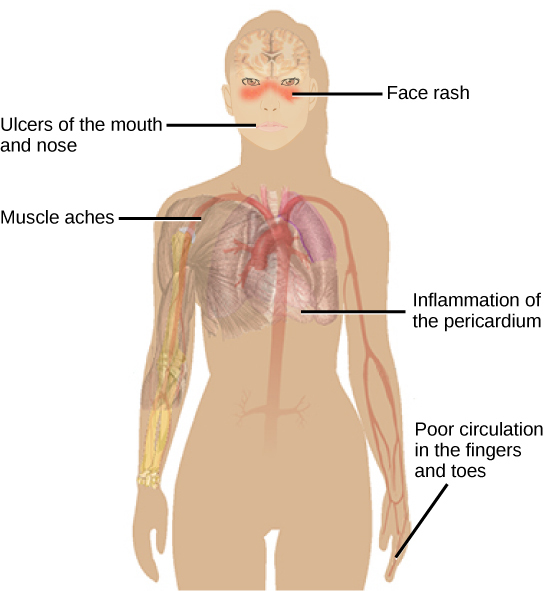 Systemic lupus erythematosus may affect the heart, joints, lungs, skin, kidneys, central nervous system, or other tissues, causing tissue damage via antibody binding, complement recruitment, lysis, and inflammation. SLE and autoimmunity: Systemic lupus erythematosus is characterized by autoimmunity to the individual’s own DNA and/or proteins, which leads to varied dysfunction of the organs. Autoimmunity can develop with time; its causes may be rooted in molecular mimicry. Antibodies and TCRs may bind self antigens that are structurally similar to pathogen antigens, which the immune receptors first raised. As an example, infection with Streptococcus pyogenes (bacterium that causes strep throat) may generate antibodies or T cells that react with heart muscle, which has a similar structure to the surface of S. pyogenes. These antibodies can damage heart muscle with autoimmune attacks, leading to rheumatic fever. Insulin -dependent (Type 1) diabetes mellitus arises from a destructive inflammatory TH1 response against insulin-producing cells of the pancreas. Patients with this autoimmunity must be injected with insulin that originates from other sources.